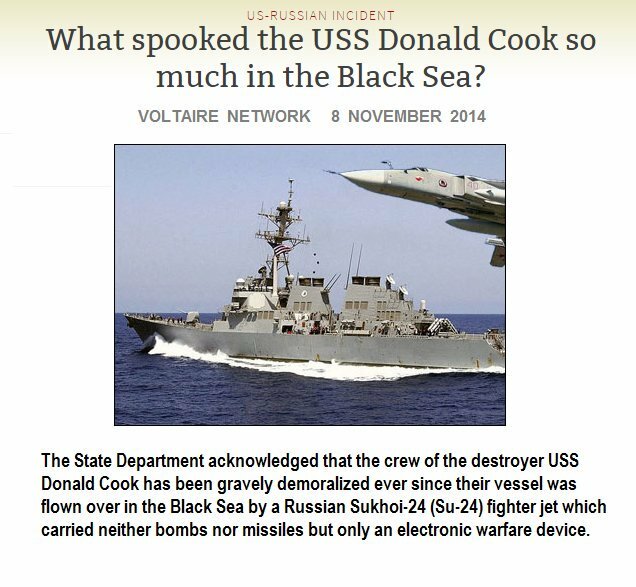 According to this report, in April-2014, the leftist-socialist Obama Regime provocatively ordered the Arleigh Burke-class guided missile destroyer USS Donald Cook to sail into the Russian-protected waters of the Black Sea—with it then being met with superior Russian electronic countermeasures that left it dead in the water, and its crew so demoralized, 27 of them requested to be relieved from active service. 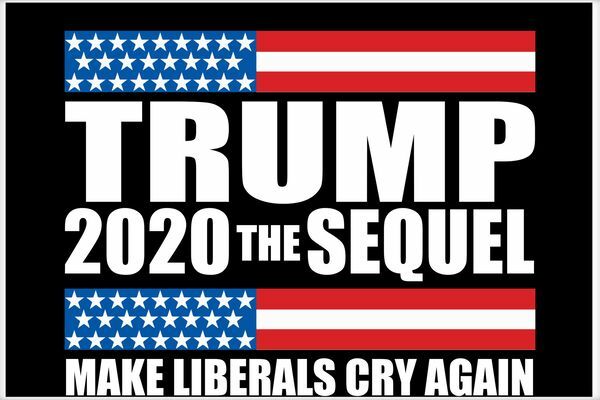 With credible coup threats against President Trump becoming harder to ignore, with some warning he may only have 11-days left in power, this report continues, the assaults against him have accelerated over the past few days with the “Deep State” aligned Washington Post publishing an article titled “The Shabbiest U.S. President Ever Is An Inexpressibly Sad Specimen”—the equally “Deep State” aligned MSNBC cable news network warning their leftist-socialist viewers that Trump is preparing to order his tens-of-millions of supporters into the streets of the US to start a civil war—and top Democrat Party US Congressman Eric Swalwell declaring “all evidence I’ve seen shows Trump is a Russian agent”—a convoluted mangling of logic as his “evidence” needs no proof with his stating all he has is “I haven’t seen a single piece of evidence that he’s not”—all of which were followed by someone of not sound mind thinking it would be a good idea to sail the USS Donald Cook back into the Black Sea where, like in 2014, Russian military forces are prepared to destroy it. 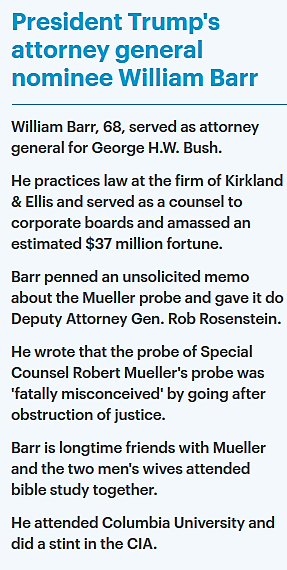 With the war between President Trump and his “Deep State” enemies threatening to explode into a global conflagration, this report notes, Trump appointed William Barr to be his US Attorney General—with virtually none of the American people knowing that Barr is a feared CIA master operative who has rampaged through the “Deep State” establishment for decades protecting both his intelligence agency and US presidents from all threats and investigations—while at the same time, keeping the US and former Soviet Union from blowing each other up by keeping hidden all of their secrets. 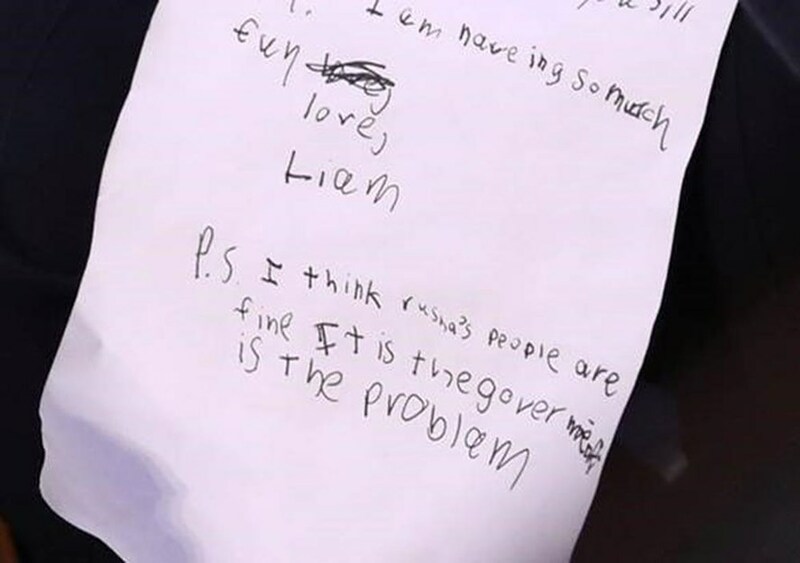 In US Attorney General nominee William Barr having his grandson Liam display a message showing he had no animosity towards Russia, this report details, he then truthfully told his US Senate questioners that China, not Russia, was the greatest threat facing the United States—a position that’s grounded in his deep Christian faith that, in 1992, led him to blast America’s public schools for no longer providing moral instruction, with his asserting that public schools had undergone a “moral lobotomy” he blamed on “extremist notions of separation of church and state”—and his, also in 1992, attacking “modern secularists” for ushering in cultural decline and his remarking “the secularists of today are clearly fanatics” and stating “to the extent that a society’s moral culture is based on God’s law, it will guide men toward the best possible life”. With America having now having become the world’s new “socialist frontier”—a great historical irony as that unlike the Russian people who understood the perils of socialism and fought the Bolsheviks in a bloody three-year civil war that by some estimates took fifteen million lives, the freedom-loving Americans keep voting themselves into socialism, this report concludes, President Putin has determined that with the feared master CIA operative William Barr by his side, President Trump will not only be able to survive the “Deep State” coup plot threat against him, but also win reelection next year—an assessment confirmed as being true by Lord Ashcroft who runs the globally respected Lord Ashcroft Polls organization in London—and whose just released poll of over 15,000 Americans shows Trump’s hopes of securing six more years in the White House are actually being boosted as Democrats stage a Jeremy Corbyn-style lurch towards socialism—with his explicitly stating: “Young Democrats blinded by their hatred of the Donald risk picking a presidential candidate so Left-wing that all they will guarantee is six more years of Trump”. 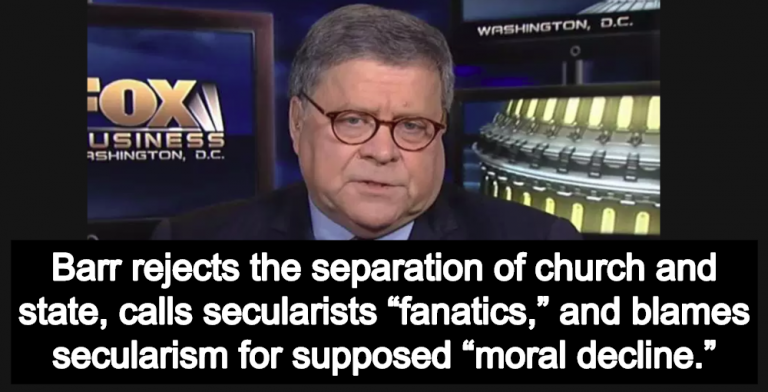 January 20, 2019 © EU and US all rights reserved. Permission to use this report in its entirety is granted under the condition it is linked back to its original source at WhatDoesItMean.Com. Freebase content licensed under CC-BY and GFDL.